Fidel Alejandro Castro Ruz ( audio) (August 13, 1926 – November 25, 2016) was a Cuban revolutionary and politician. He was Prime Minister of Cuba from 1959 to 1976, and President from 1976 to 2008. He temporarily gave power to his brother Raúl Castro while recovering from surgery in summer of 2006. On February 19, 2008, he announced that he would not return to power. He was in power for 49 years. Castro was born in Birán, Cuba on August 13, 1926. He received a doctorate of law from the University of Havana. He was trained as a military lawyer. He came to power after he and his guerrilla soldiers overthrew the dictatorship of General Fulgencio Batista. Castro was a communist and he made Cuba the first socialist country of the Americas. During the Cold War he was a friend of the Soviet Union, and he depended on their help until the USSR collapsed. An important moment of the Cold War was the Cuban Missile Crisis of 1962. In October 1962 the United States of America discovered that the Soviet Union was placing missiles on Cuba, close to the United States. After very tense talking, a big nuclear war was avoided between the Soviet Union and the USA. Some people call Castro a dictator. They criticize him, because they think he has ignored some human rights, for example, torture, murder and oppression of freedom of speech, both at home and in African countries where he sent Cuban soldiers to spread Communism. Other people do not think this is true. For example, Nelson Mandela has spoken in support of Castro and has thanked him for aid to Africa. Amnesty International criticized Cuba's human rights record but noted slow progress in July of 2002. Supporters of Castro say he gave Cuba the best health care and education of Latin America and created equality between the poor and the rich. Castro's first wife was Mirta Díaz-Balart. They married in October 1948. They had a son Fidel Ángel "Fidelito" Castro Díaz-Balart, born in September 1949. Díaz-Balart and Castro divorced in 1955. In 1980, Castro married Dalia Soto del Valle. Their marriage would end with Castro's death in 2016. On November 25, 2016, Castro died at age 90 of natural causes in Havana, Cuba. President Raúl Castro, his brother, announced Fidel's death on state television. His remains were cremated on November 26, 2016. ↑ 1.0 1.1 "Cuba's Fidel Castro dies aged 90". BBC News. November 26, 2016. Retrieved November 25, 2016. 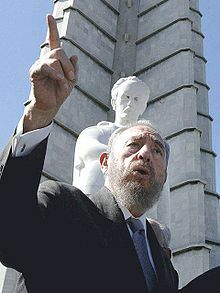 ↑ 2.0 2.1 2.2 2.3 "Fidel Castro: Political Leader of Cuba". Encyclopaedia Britannica. November 26, 2016. ↑ "Fidel Castro announces retirement, at BBC Online". ↑ "Mensaje del Comandante en Jefe (Spanish, original letter at Granma)". ↑ "Message from the Commander in Chief (English translation of the Letter, at Granma)". ↑ 6.0 6.1 "Cuban Missile Crisis". History.com. A&E Networks Corp. 2010. ↑ "Fidel Castro's dark legacy: abuses, draconian rule and 'ruthless suppression'". The Guardian. Guardian News and Media Limited. November 27, 2016. ↑ Bearak, Max (November 28, 2016). "Fidel Castro, African Hero". The Washington Post. WP Company LLC. ↑ Amnesty International Publications. Amnesty International Report 2003 (Report). The Alden Press. pp. 87–89. ISBN 0-86210-313-4. ↑ 11.0 11.1 11.2 11.3 "Meet Fidel Castro's Family: Torn Apart by Bitterness, Rows and Dysfunction". The Telegraph. Telegraph Media Group Limited 2016. November 26, 2016. ↑ Zabludovsky, Karla (November 25, 2016). "Fidel Castro, Longtime Cuban Leader, Dead At Age 90". BuzzFeed. Retrieved November 25, 2016. This page was last changed on 18 April 2019, at 18:17.